You are about to witness what happens when a long-standing bluegrass group embraces their melting pot of roots music influences, expands into an electric band, and works its magic on songs across all genres. 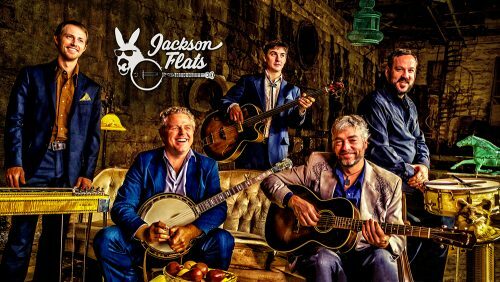 Jackson Flats will rev up your crowd with an astonishing array of party classics from traditional Bluegrass, Country, Pop, Rock, Soul, R&B and beyond. Expect a repertoire that runs the gamut from Johnny Cash to The Beatles, Willie Nelson to Prince, Smokey Robinson to The Rolling Stones, all delivered with warm southern charm and infectious energy. Honing their sound as leaders in the Richmond Virginia scene, these are five of the best players you will find anywhere. In their early days, Jackson Flats won the Virginia State Bluegrass Championship and Best Americana Band at the Virginia Music Awards. This band is a true phenomenon with a long history of wowing crowds and helping turn already memorable moments into a funky southern good time!